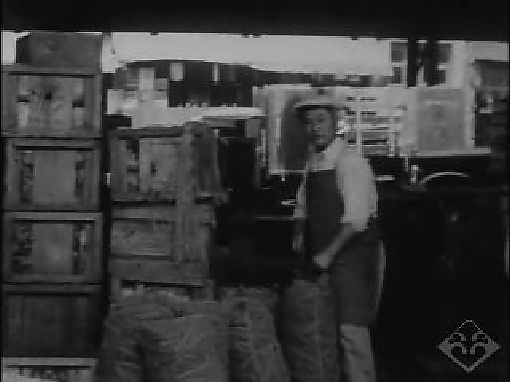 Black & white footage of the Los Angeles 7th Street produce market, farming, festival at night, family life and a Catholic church service in Los Angeles, California, ca. 1930s. Includes footage of men packing and selling produce at open market, workers harvesting and tending fields, dog and puppies, blimp passing outside a Buddhist Church, taiko on parade float at a night festival with crowd in suits and kimono, brief shot of young woman in Japanese garden next to pond, family reading newspaper at home and attending a Catholic church (12:53). Credits: Soshiro Kiyama Collection, Gift of Hiroko Roppiyakuda, Japanese American National Museum (2004.7.1). Preserved and made accessible in part by a grant from the National Film Preservation Foundation. HNRC — Atualizado em Mar 29 2018 12:46 p.m.